Aloe ferox - Bitter Aloe (e), Bitteraalwyn (a), iNhalaba (z), Khala (x) This single stemmed, hardy Aloe has large, attractive, succulent leaves with dark brown spines on the margins. They turn dull red under drought conditions. The beautiful spikes of tubular flowers that vary from orange to red are carried on an erect, very showy candelabrum shaped inflorescence from May to Aug. With its single stem and large fleshy leaves it makes an excellent accent plant. Birds and insects are attracted by its copious nectar. 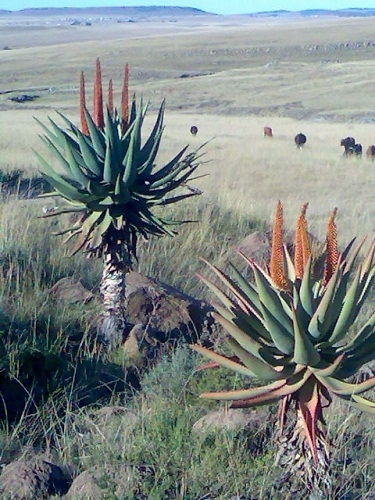 It is extensively used for medicinal and cosmetic purposes and there is a whole industry producing "Cape Aloes" and other products for the medicinal and cosmetic industries. Size 2 to 3m. S.A. No. 29.1. Sowing : Seeds germinate very well but may damp off if overwatered. Use a mixture of river sand, compost and soil to sow seeds in. Sprinkle the seeds evenly on the surface and cover with a layer of small pebbles. The pebbles help the seedlings to stay upright and prevent damping off. Keep seed tray in a dry warm corner and do not allow to dry out. Transplant the seedlings after one year. Locality : Swellendam. Date of harvest : Aug 2018.